When Huxley died, he was agreeably surprised to find himself doing a journey in an electric railway underground, in a carriage better than the best Pullman cars but not unlike them, and just sufficiently filled to be pleasant. The train was incredibly fast, but went without a jolt. Only by feeling for it, so to speak, could he, when standing, discover a gentle wave of motion, which became imperceptible when he subsided into a chair. Before he could talk to any fellow-passenger, the train came to a stop. He got out with the others, and went through a long and spacious passage, bright with shining tiles and electric lamps. It was more like the nave of Westminster Abbey than any tunnel, and, long though it was, he had not ceased admiring it when he came out into what seemed to be an infinitely improved Crystal Palace, expanded into boundlessness. At any rate, the eye could see no bounds. The light was bluish, but soft, abundant and agreeable. Circular fans were whirling above little round tables, at one of which he took his place and called for ice. “I fear there must be some mistake,” he said to the smiling waiter, who stood rubbing his hands after fetching the ice-cream, and was asking what he wanted to drink. “Mistake, sir?” asked the waiter, looking at the plate he had just put down. “Oh, not in this; this is all right,” said Huxley, sipping, and looking again round the bustling scene, where every man and woman seemed to be cheerful and merrily employed. “What I fear is that some mistake has been made about my destination. The ticket I gave up at the door was for…” He paused. “Hell, sir?” asked the waiter, briskly. 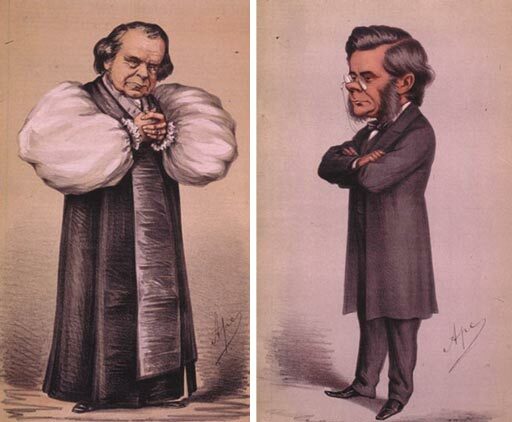 “I hope to come back and see you another time, Huxley,” cried Wilberforce, for he it was! He waved his hand affectionately and smiled, as if he were alive again for a moment; and then as he looked elsewhere his countenanced gradually changed. Mephistropheles stood grinning sardonically while the sad Celestial turned reluctantly Heavenwards, and floated upwards and away with a look of constrained resignation on his features, an expression of infinite ennui, if that can be called an expression, which seemed to have become suddenly as unchangeable as the streak of the Milky Way.